Meeting of the Members-The AAPT Meeting of The Members will take place on Sunday, January 10, 2016 from 8:30 - 10:00PM. The agenda for the meeting can be found here or under the program tab of the Winter Meeting website. Connections Matter, AAPT's member referral program ends on January 31, 2016. 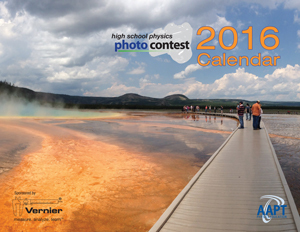 Someone will win a Free Trip to the 2016 Summer Meeting as the grand prize. Will it be you? Recruitment tips and tools are available online. Visit www.aapt.org for further details. NGSS-based Strategies for Facilitating Student Learning in Chemistry and Physics. Learn a number of NGSS-based strategies you can use and adapt in your classroom from experienced physics teacher and AAPT member Frank Lock. Come prepared with your questions to make the most of this interactive webinar. This is the second webinar in our series presented in partnership with the American Association of Chemistry Teachers. Did you know that AAPT has co-sponsored five career development webinars for its members? Thanks to generous support from the National Science Foundation, AAPT in collaboration with the American Physical Society and the American Astronomical Society is hosting a workshop March 18-20, 2016 at the American Center for Physics aimed at tenured faculty members who want to learn more about effective physics and astronomy teaching practices and the evidence for the effectiveness of those practices in their roles as department leaders, mentors for junior faculty members, and physics and astronomy educators. The workshop will have a mix of presentations by national leaders such as Eric Mazur and small group discussions. An online application form will be available on the AAPT web site in early January. You need to apply before February 5, 2016. Please apply early because the number of participant slots is limited. Also, please bring this notice to the attention of other faculty members who would benefit from attending the workshop. Limited financial support is available for travel and registration expenses for faculty at minority-serving institutions and from departments with severely limited financial resources. The American Association for the Advancement of Science (AAAS), with support and funding from the National Science Foundation, is currently seeking U.S. female faculty researchers in Science, Technology, Engineering and Mathematics ( STEM), from Minority-Serving Institutions, who are interested in attending the Gender Summit 8 (GS8) in Mexico, on April 28-29, 2016. If you are interested in creating and developing International Research networks, submit your application today at the following link www.aaas.org.